Hey everyone! If you follow me on Facebook or Instagram, you would have seen that we recently bought a new house and I've been up to my eyeballs with projects. Walls have been built, walls have been torn down, and I have lots of tutorials coming at you soon! In the meantime, I've been working on a couple furniture projects (since remodeling a house doesn't keep me busy enough). I built a shiplap inspired headboard for a friend and I'm guest posting over on The Home Depot Blog, showing you how. 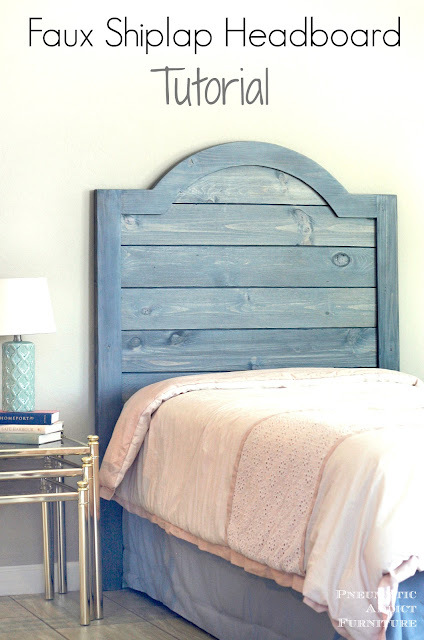 I'll be sharing the "before" pics of my house in a few days, but in the meantime, head over and learn how to build you own Faux Shiplap Headboard! Love this idea!! Love everything ship lap these days :) Thanks for the tutorial!